Sam the cat is very happy living with his owners Jane and Ian – until Jane brings home a baby. Not only do Jae and Ian spend all their time doting on the new addition – but they also give it his name. Now Sam is expected to answer to Jack – and he’s not happy. In disgust, he takes a walk, the longest walk he’s ever taken, and before long he’s lost. Far from home. When Ian finally finds him, Sam doesn’t care wha they call him – as long as he can be home with his family. Sam the Cat is a picture book based on the true story of how the author got his name. Trues story or not, youngsters will enjoy the idea of a cat facing an identity crisis, with echoes of the familiar story of sibling rivalry between toddlers and new babies. Illustrations, in pen, ink, watercolour and pastel, show a big-eyed ginger and white cat whose expressions evoke both sympathy and smiles. As soon as I wake up, I remember that today is special. There’s nothing like a country show, and in Show Day, author Penny Matthews captures the fun and magic of the day. Told through the first person perspective of young Lil, the story follows a family from waking up in the morning, getting ready and travelling to the show, and the events of the day. Every member of the family has entered at least one competition – Dad for marmalade and wood chopping, Mum for cakes and pumpkins, younger brother Henry for chickens and Best Pet, and Lil for Most Unusual Pet. They don’t all win, but there are prizes, fun and surprises. There are also plenty of other show experiences including rides, showbags and things to eat. Andrew McLean’s watercolour illustrations bring the text to life and add lots of little glimpses of the fun and activity of the show. Young readers will enjoy spotting details like the variety of pets in the pet tent, and the side shows in side show alley. Show Day brings to life a fun tradition of Australian life. Especially pleasing is the rural setting, and the sense of family fun which is prevalent. And jump out of bed! There’s a Goat in My Coat is a picture-book sized, hard cover collection of poetry from the author of the ‘Playschool’ song ‘There’s a Bear in There’. The opening poem is about getting out of bed, and the final poem rounds off the collection with the same poem, re-jigged for going to bed. In between, there are poems to reflect a wide range of days. Some are nonsense narrative poems like ‘Bouncy Bear’ and the more realist ‘Round and Round the Roundabout’. Others are about slippers and socks and rolling down hills. The title of the collection comes from a poem called ‘I’m a Walking Zoo’, a nonsense rhyming poem. There are long poems and short ones and following around the page ones. Illustrations range from real to absurd and are loose watercolours and pencil. It’s clear from the outset, that There’s a Goat in My Coat is going to be a fun collection for young children. It’s silly and funny and perfect to read out loud. The content is styled to make the listening to the individual words and lines as much fun as the poem itself. There’s a mixture of poetic styles too, with rhyming poems, rhythmic ones, and others that employ repetition to good effect. There are poems that ask to be acted out, poems for counting, observational poems, something for every taste. The illustrations add to the humour and fun. Some are full colour, others are set in white space. Front endpapers are set on the same sunny yellow as the cover, while the end endpapers reflect the going to bed of the final poem. A perfect collection to give away as a gift, or to keep to share with your own young children. Since its first publication in 1908, this poem has been learnt, sung, recited and cherished by countless Australians. Now, it is brought to life in stunning watercolour to be loved and cherished by a new generation of readers. My Country combines the original poem by Dorothea Mackellar with sumptuous watercolour illustrations by illustrator Andrew McLean, who captures both the beauty and the diversity of the Australian landscape. the design of the book is also beautiful, with the cover presented like a leather-bound album with picture insert, and the endpapers adorned with gumleaves. A lovely gift, likely to appeal to children and adults and also suitable for classroom use. Lucky Clive lives at Number Five Squeak Street. Every morning he gets up early to bake cakes for his shop and every day customers queue up to buy them. He loves his job. But on a late-night dash to buy a missing ingredient he runs into two old friends from school. Roly has written a book and Daisy is a film star. Both are rich and have very exciting lives. Poor Clive realises he hasn’t changed a bit since school and decides it is time to do something different. Soon Clive is sitting at the Loads of Jobs agency, keen to try a new career. The agency has plenty of jobs – Clive can be a broom salesman, or a clown, or even a mouse-eating-fish feeder. But what will the other residents of Squeak Street think when they can no longer buy Clive’s delicious cakes? Lucky Clive is the fifth book in the Squeak Street series, a chapter book spin-off from the popular Squeak Street picture book. At just 2000 words in length, with a high ratio of illustration to text, these are aimed at beginning readers making the transition from early readers and picture books to novels. Lucky Clive is a fun tale. Billabong’s Daughteris the eighth in a series of fifteen books about Norah Linton and her family on their station, Billabong. The series was very popular with girls as they were printed, and has touched generations of Australians and others. Billabong is an isolated cattle station in Northern Victoria in the early 1900s. Having never known her Mother, Norah lives with her Father, David, elder brother, Jim, and adopted brother, Wally. An enjoyable book, with much to give younger readers, Victoria’s Market is about a young girl and her father going on their weekly shopping trip. The story itself will interest children, as they can understand the idea of a child being separated from her father in a public place. Like most children would, Victoria wanders around the market looking for her father, rather than staying still for him to find her. From page to page, the book alternates perspective between Victoria and her father as they search. Much to the children’s amusement, Dad is constantly seeing unusual beings at the market: a giant, a werewolf, a monster, a spy and a vampire, just to name a few. The pictures and text show the diversity of things available at a market, giving many opportunities for discussions about foods and produce. It is also a great lead in-book for children about to visit a market and for children able to visit the Queen Victoria Market, it is even more appropriate as the book is based there. Illustrations by McLean are coloured sketches and they include many details so that it is easy to imagine being at the market with the characters. Eventually, Victoria and Dad meet up near the food stalls and have their usual treat together. Observant readers will then discover that Dad wasn’t really imagining things in the Market! I have never seen the beach before. “What does it look like?” I keep asking. “And sandy,” says Uncle Daniel. “And sometimes it’s wavy,” says Dad. Trying to imagine what the beach is like without having ever seen it is hard for a young child. But this little girl has plenty of delightful experiences on the trip to the beach which influence what she imagines the beach will look like. This is much less a book about the beach than it is about travelling and dreaming. The adults in the story ensure that the trip to the beach – over several days – is full of experiences and special moments. Together the family picks strawberries, buys treasures in an op shop, presents family concerts and just revels in the delight of ‘being’. Each new day of experiences influences how the child imagines the beach will be when they finally arrive, although nothing prepares her for what she eventually sees when they do arrive. On Our Way to the Beach is a delightfully crafted book, with both the story and the illustrations full of whimsy. 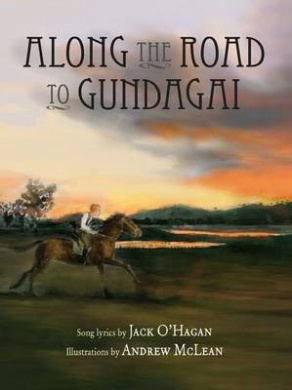 It is a peaceful bedtime story and an excellent classrom sharing book, especially for chidlren in inland parts of Australia who will relate to the expectation and excitement about a trip to the beach.